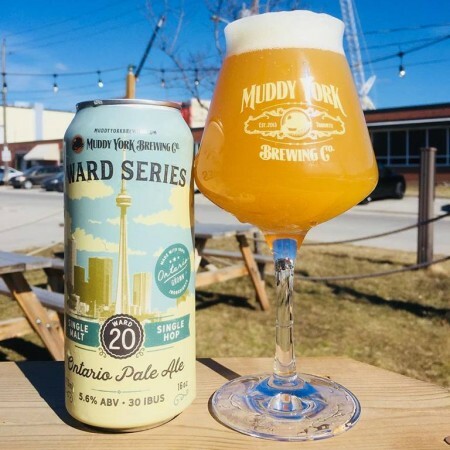 TORONTO, ON – Muddy York Brewing has announced the release of a new beer made especially for the restaurant that sits atop one of Toronto’s most iconic landmarks. Ward 20 Ontario Pale Ale (5.6% abv, 30 IBU) has been brewed to be featured as a special seasonal offering at 360 Restaurant at the CN Tower. As the name suggests, the beer was brewed using 100% Ontario ingredients, including Barn Owl Malt and Chinook hops from VQH Farms. Ward 20 Ontario Pale Ale is available now at the Muddy York taproom and retail store, and will soon be on the beer list at 360 Restaurant for the spring and summer months.